The Indian Civil Rights Act will be 40 years old in 2008 – and Santa Clara Pueblo v. Martinez will be 30. We have decided to dedicate our 5th annual conference to the Act and to Martinez. Confirmed speakers already include Kristen Carpenter, Trent Crable, Marty Curry, Gordon Henry, Sonia Katyal, Elizabeth Kronk, Stacy Leeds, Dan Lewerenz, Catharine MacKinnon, Rebecca Miles, Eva Petoskey, Frank Pommersheim, Angela Riley, Mark Rosen, Wenona Singel, Paul Spruhan, Rina Swentzell, Melissa Tatum, Ann Tweedy, Gloria Valencia-Weber, Rose Cuison Villazor, and others. 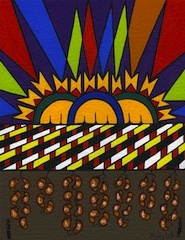 A picture of our postcard, with artwork by Sam English, is on our MSU website. Registration for this event is now available online here. Parking at the Wharton Center lot will be validated for the conference. Maps of the lot and the law school are available here and here. The official conference hotel is the East Lansing Marriott at 300 MAC Ave. in East Lansing. Directions to the All Seasons Bistro from both the Law College and the East Lansing Marriott are available in the conference materials.